This poster in front of the store says: We plant 2 trees for every tree we cut. This same store is being awarded ‘The Best grocery Store’ award. It is posted in front of their store. Are trees separate from us? Do we care about the plants, specifically the trees that are being cut every year for the christmas season so that humans can have a beautiful christmas decoration? 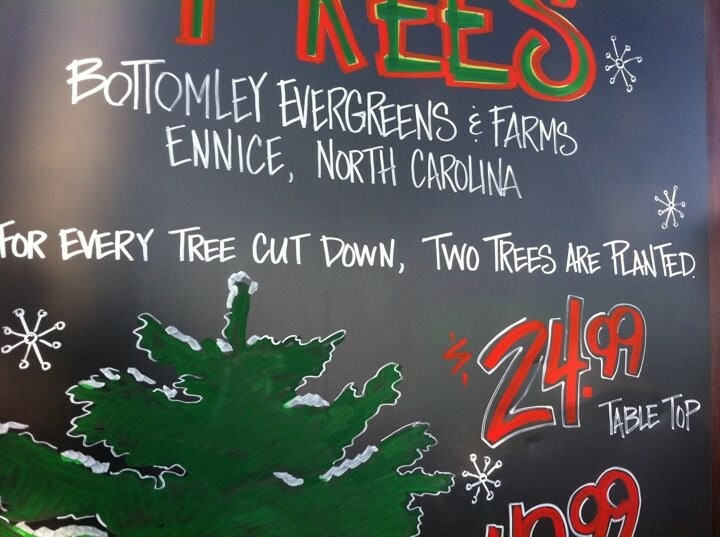 Here’s what’s posted in front of a store: We plant 2 trees for every tree we cut. Right next to it reads “The Best Grocery Store Award”. This is like saying it is okay for us to kill humans, we can just make 2 babies for every person we kill. This is unacceptable. We are one and equal as all life as we all (the body is being sustained by the earth) come from the earth. The trees are one and equal as us . We have to stop cutting them to use for events that will make us happy – happiness in the name of tree slaughter? This is unacceptable. We also have to stop supporting cutting trees for profit. Humans, animals, the earth and plants are one and equal as all LIFE because they are made of the same substance that all are made of. I would like to do self-forgiveness for perceived separation from pine trees. I will also do self-forgiveness for abuse of pine trees by cutting them to celebrate an event. I forgive myself that i have accepted and allowed myself to cut trees and buy live christmas trees for the christmas season just so my family and friends and me can have that christmas spirit. I am that which is equal to all that is here. I forgive myself that i have accepted and allowed myself to perceive myself separate from pine trees. I am one vote for an equal money system – a new system that will end all abuse of all life forms in the name of self-interest – within the current monetary system that is based on inequality.